Fun, different, and above all effective, capoeira is a unique dance-fight-fitness program enhancing strength, stamina, and flexibility training for the entire body. While there are many books on the subject, this one differs in being a succinct yet thorough discussion of the basics to engage even the nervous novice. In clear, accessible language, author Mestre Ponchianinho explains the aims and benefits of the discipline, along with its history, origins, and philosophy. He continues by introducing the two main styles along with the techniques of the most famous mestres. Easy-to-follow warm-ups, basic moves, defense and escape moves, kicks, training combinations, strengthening exercises, ground movements; and more advanced acrobatic movements are all described and illustrated in step-by-step photographs. 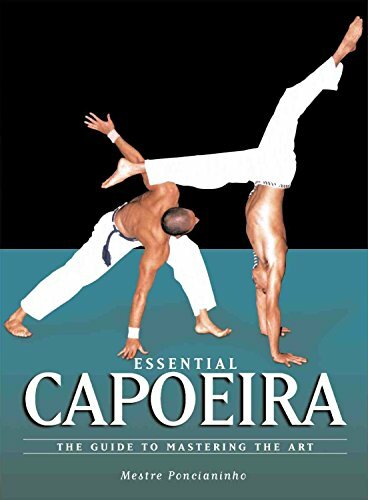 The author discusses the self-defense aspects, the importance of music in capoeira, the significance of the bateria, the hierarchy within the tradition, the grading system, and much more. Unlike other martial arts disciplines, capoeira lets practitioners give play to their artistry as well as their physicality, in the process sharpening the mind and spirit while energizing and strengthening the body. Ponciano Almeida began studying capoeira in Brazil at the age of four and was teaching with the Cordao de Ouro school by the age of fifteen. An instructor and performer who appeared in Harry Potter and the Goblet of Fire, he lives in London.